Today I start by sharing the thoughts of another writer and will build from there. 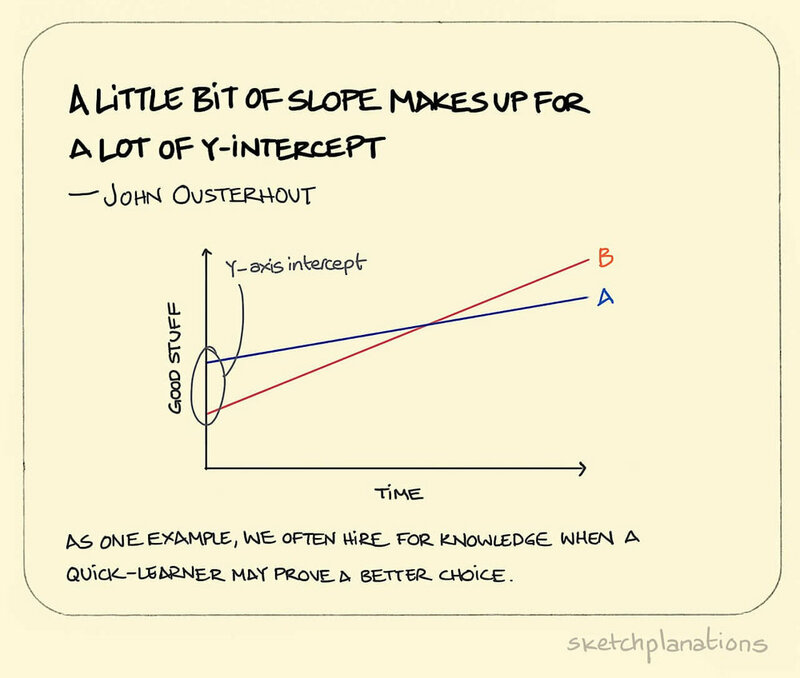 Read the full story of Stanford Professor John Ousterhout’s thought for the weekend: a little bit of slope. Behavior-styles are a group of related behaviors that have a common source stemming from one’s personality and is influenced by life’s experiences. During the past few weeks I have led several team-building programs with the purpose of helping team members to identify and share their individual behavior-styles, preferences and workplace needs with one another. By sharing these characteristics about themselves, team members can find ways way to improve their relationship through better communication, for example, and therefore have more effective teams. The ability to modify or “flex” one’s behavior-style to meet the needs of your teammate is the required skill for building better relationships. A common question in this program and others like it, is whether one behavior-style or characteristic is better than another. The answer is no. Every style has strengths and limitations. All styles are found in all parts of an organization. As part of the current program, participants examine the distribution of styles on their team. When they see a limited distribution of styles, a common question is whether or not they should add people who tend to exhibit the missing behavior-style. The answer is no. Teams should not be built and people should not be hired based on their personality- or behavior-styles. (These tools are not made for that purpose, and behavior-styles are innate characteristics.) Individuals should be added to a team according to their competencies, knowledge and skills. When it comes to building teams and identifying members for the team, focus on competencies, knowledge and skills. When it comes to behavior styles, the skill on which you want to add someone to your team might be their ability to flex their style to build better relationships with one another. Flexing is a skill. To do this, a team member needs to have self-awareness of their own style and its strengths and limitations; they need to recognize the styles or needs of others, and they need to know how to change their behaviors to meet the needs of others. In the article that began this essay, Osterhaut suggests it is not where you start, it’s how well you improve. In the same way, it does not matter what your behavior-style is, it matters how well you can use it. It does not matter so much where you start, it matters where you take it from here.